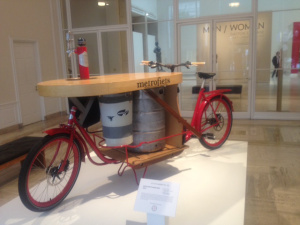 Thebeerchaser has seen the vehicle referred to as “Party Bikes” – in various cities ranging from Seattle to Denver to Amsterdam. In each case, the riders were exuberant and obviously having a good time. 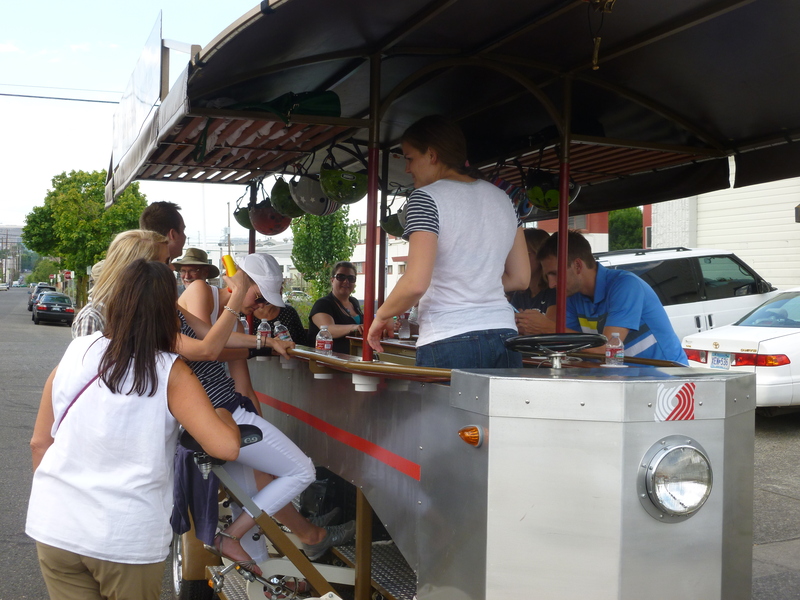 Thanks to the generosity of Kenzie Larson, a group of us hopped aboard this mode of transport on a summer Sunday afternoon to hit a few SE Portland watering holes. Lloyd, our leader (front center in the gray shirt). Owner of this small business. 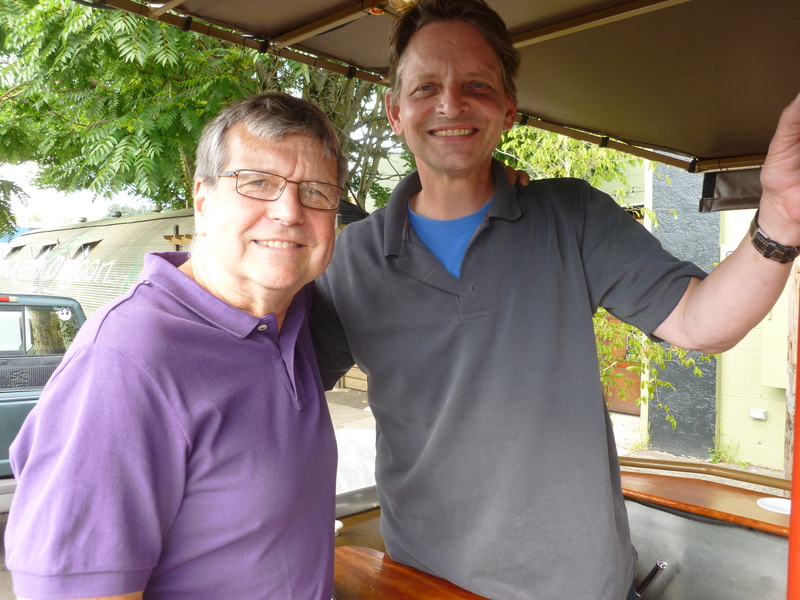 Lloyd – the erstwhile driver, owner (his company name is “Pedalounge“), cheerleader, safety officer and coxswain – after collecting our liability waivers, (much less onerous than what I signed before zip-lining in Alaska) gave us a brief admonition to be cautious and obey the rules. Lloyd barked encouragement and a lot of funny lines – some about his native state of Minnesota – he moved to Portland because his watch was two hours slow and he couldn’t fix it. He measured our pace – at one time an impressive 5 mph – and urged us onward – we responded out of a sense of morbid curiosity. His recitation of the rules was not necessary, because all of us – even though we were not wearing helmets – as if anointed by the Goddess of Two Wheels, became subservient in our attitude toward automobiles, self-righteously obeyed all traffic signals and gratuitously wanted to share the road with autos while refraining from operating on sidewalks. Perhaps we were reflecting on HG Wells statement, “When I see an adult on a bicycle, I do not despair for the future of the human race,” although I assume he might amend that assertion if he saw the Pedalounge that day. Lloyd asked us what bars we wanted to visit and helped us formulate a route, which both started and ended at the Green Dragon in Southeast Portland. 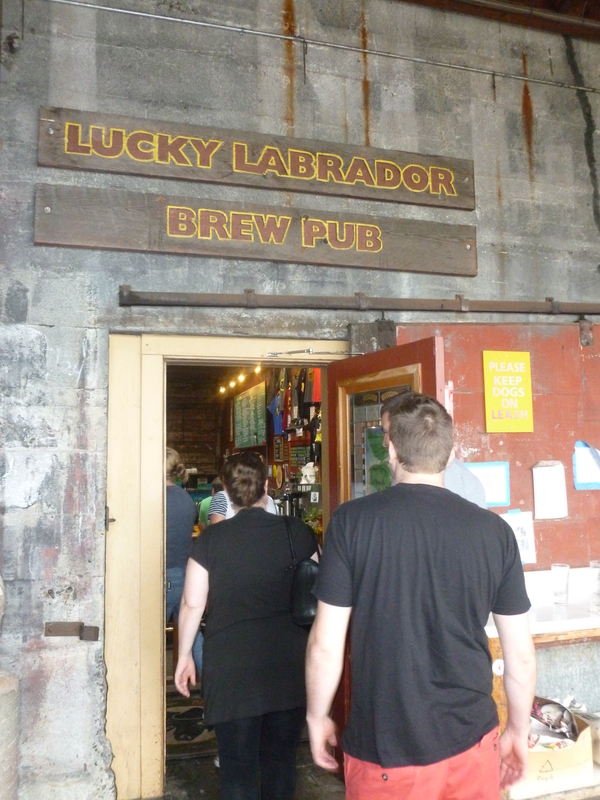 The Lucky Lab – first stop…. 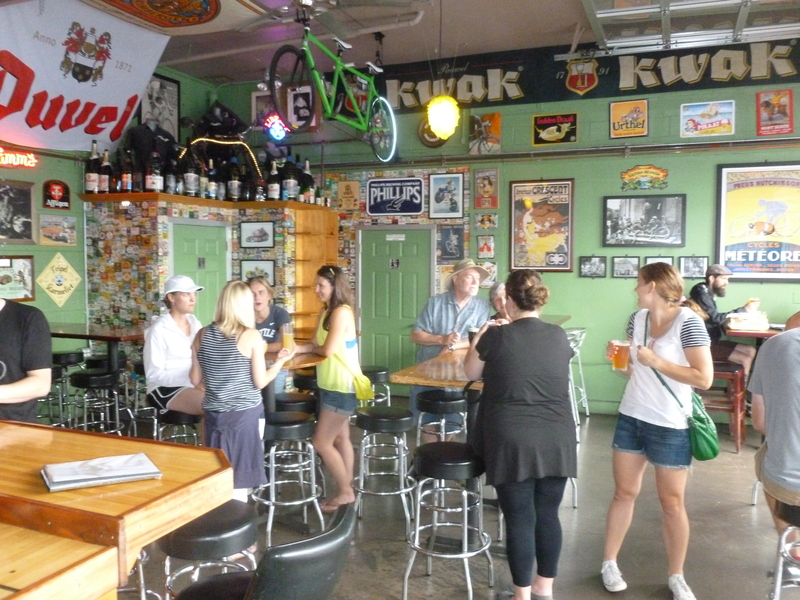 We then pedaled – drawing waves and cheers from envious passersby – to our first stop, The Lucky Lab Brew Pub on SE Hawthorne. We spent about 30 minutes there and each bar thereafter. The collaborative effort to develop enough thrust to push our conveyance generated a team spirit which was celebrated at Lucky Lab. Rejuvenated, we mounted up and spurred on by Jackson Browne’s “Running on Empty,” attained an impressive velocity. 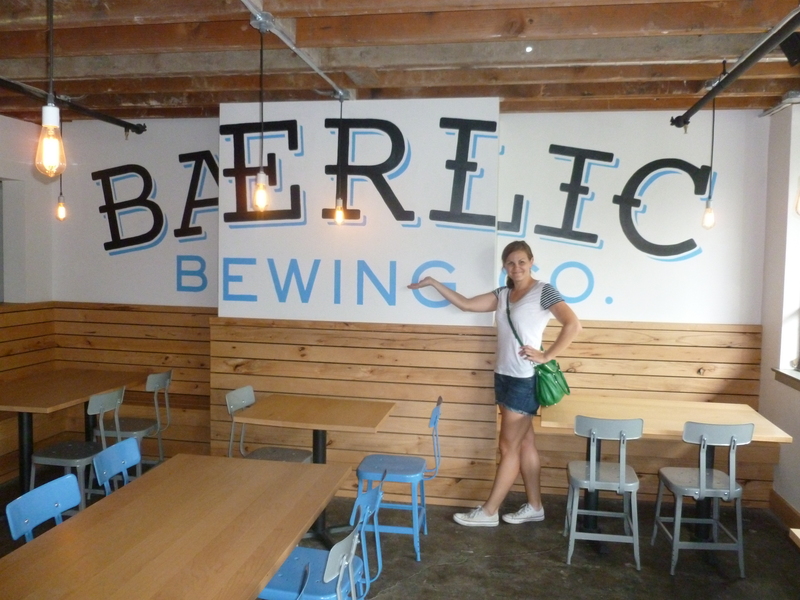 We arrived at The Baerlic Brewery and Taproom – a new micro-brewery, like many, started by two gents (Ben Parsons and Richard Hall) who for years brewed our favorite beverage in their basement and opened this enterprise in 2013. 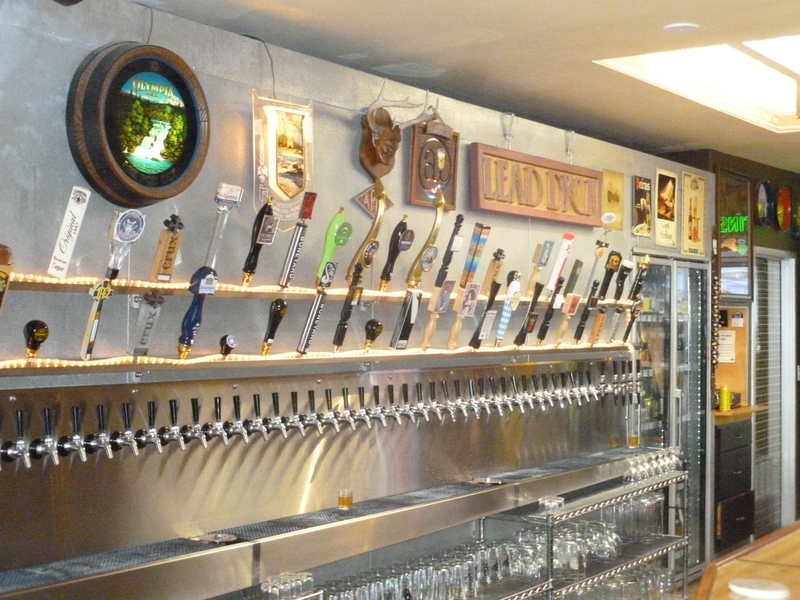 “Baerlic” is an old-english adjective meaning “of barley.” The selection is somewhat limited with only three of their beers on tap – and it is a small and sparsely furnished space, but the beer was good – most notably the Invincible IPA. By this time, we all were thoroughly enamored with Lloyd and his enterprise and since we thought it might be imprudent to nominate him for elective office, we brainstormed ideas to support him. 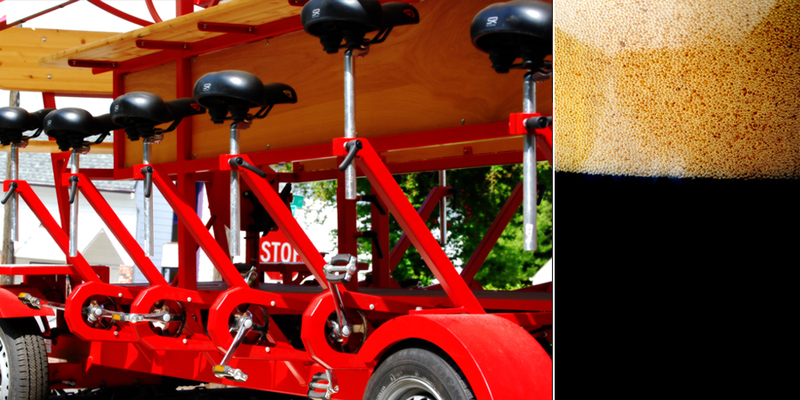 One was to bring the Pedalounge to the Pendleton Roundup this fall. 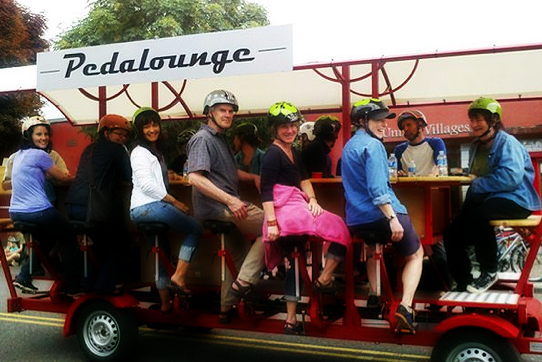 Another was for a cross-country Pedalounge trip. 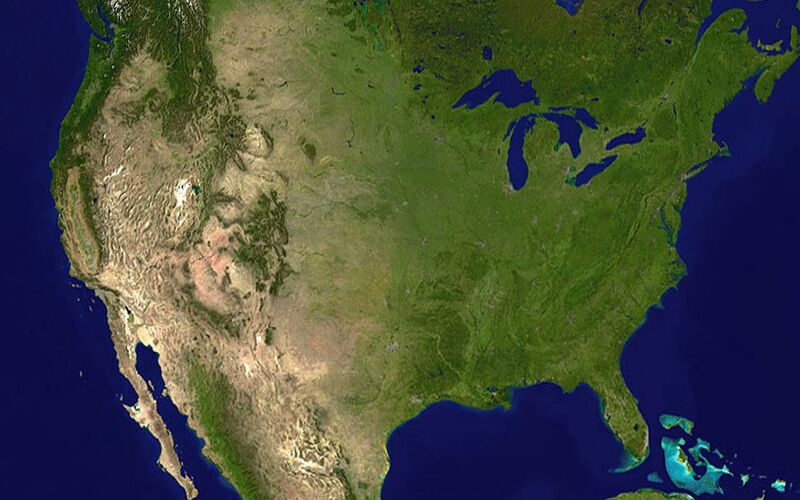 The Rocky Mountains and bathroom stops – insurmountable?? 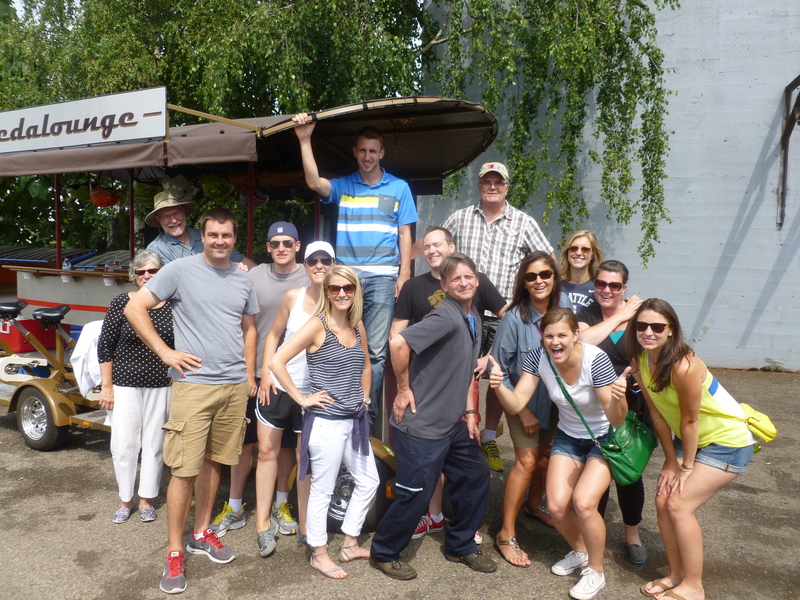 Lloyd, rounded us up and we headed for our third stop – Apex on SE Division. He resisted the temptation to play some Gaelic tunes to increase our velocity. 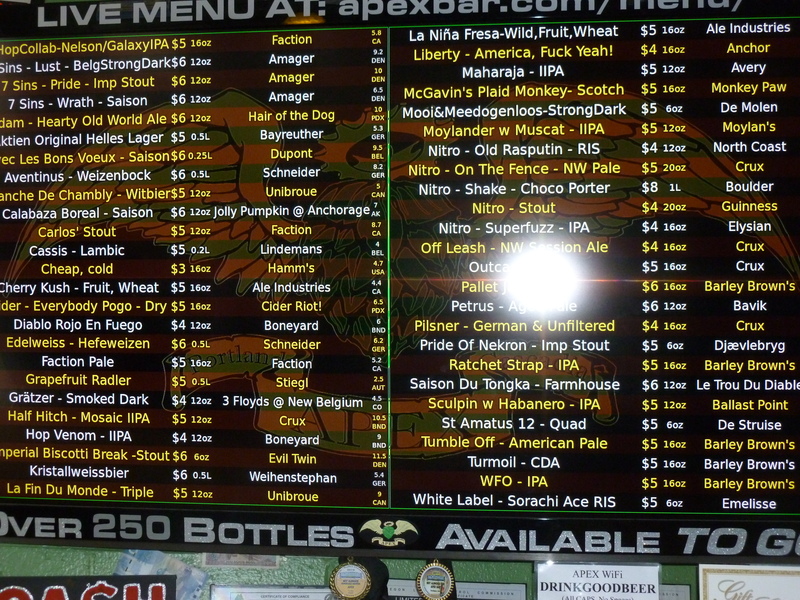 Over 50 beers on tap. While the beer selection is memorable, Thebeerchaser’s Tour of Portland’s Bars, Pubs and Taverns primary focus is the environment and character of the watering holes. 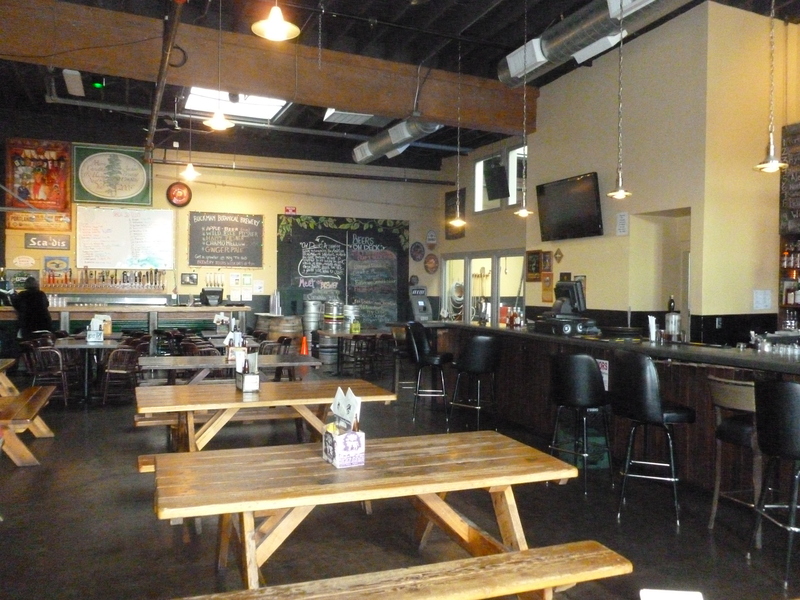 And Apex, like Bailey’s Taproom (Beerchaser review in April 2014) another one of Draft Magazine’s finest, doesn’t have a lot of ambiance and serves no food. 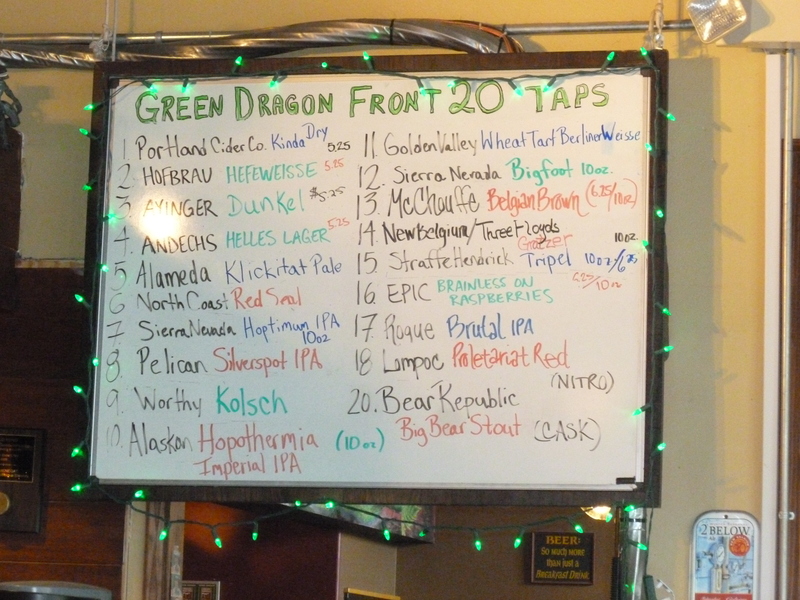 No need to have a Coors Light here…..
A robust selection of beers at the Green Dragon. 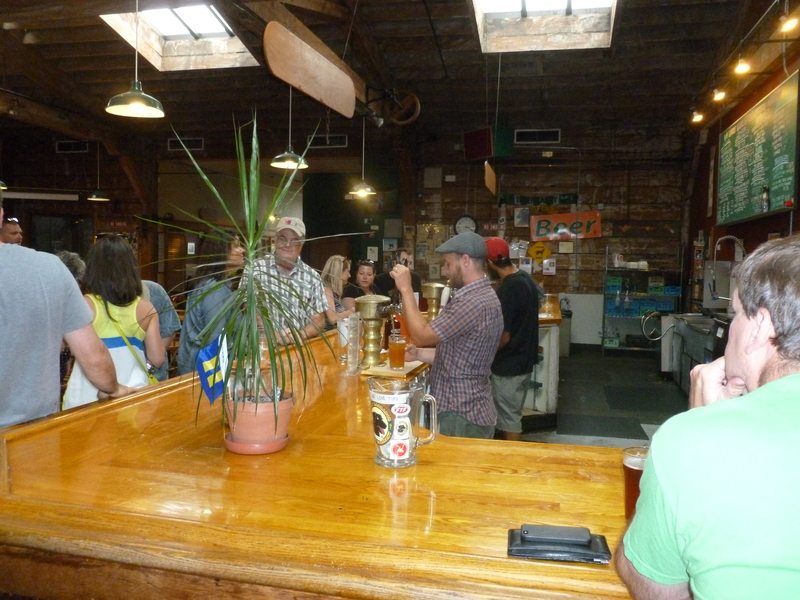 You can pick the bars in Southeast Portland you want to visit although Lloyd’s recommendations were very good. 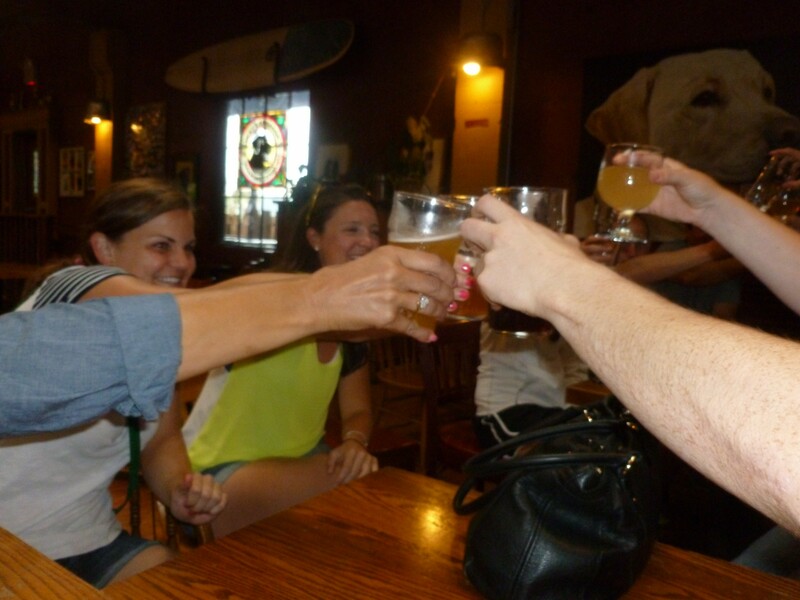 Thebeerchaser has also found after reviewing over 70 Portland bars and pubs in the last three years, that the SE area served by Pedalounge houses some of the premier establishments in our city. 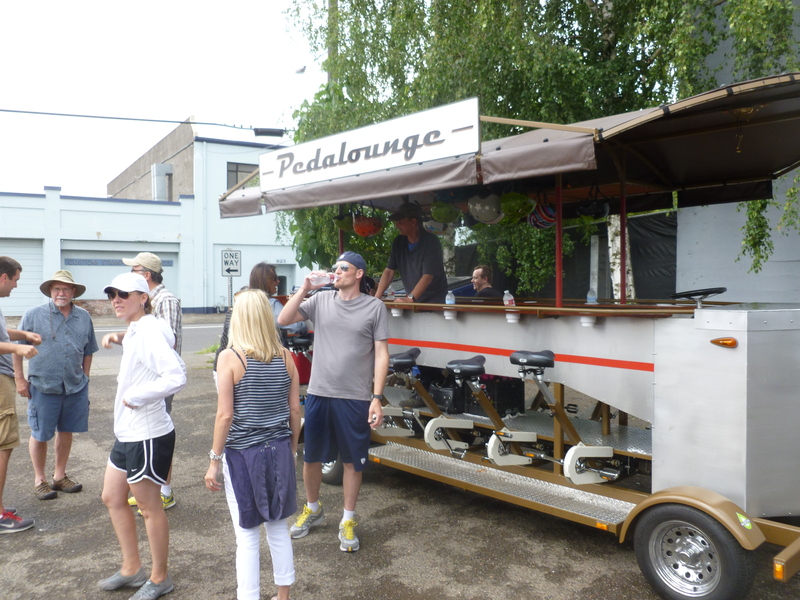 The Pedalounge price is a great bargain, the camaraderie is memorable and you will want to pay Lloyd a return visit to explore new watering holes. This entry was posted in Beerchaser Miscellany, Uncategorized and tagged Apex Bar, Baerlic Brewery and Taproom, Baerlic Invincible IPA, Bailey's Taproom, Diablo Rojo beer Boneyard Brewery, Draft Magazine 100 Best Beer Bars, Golden Spike at Promontory Summit Utah, Green Dragon Bar, Lucky Lab Brew Pub, Pedaloung Portland, Pendleton Roundup, Portland Art Museum Cyclepedia, Rendezvous Bar Salina Kansas, Thebeerchaser tour of Portland bars taverns and pubs by thebeerchaser. Bookmark the permalink. As The BeerChaser, you are actually Dr. BeerChaser who applies an invisible stethoscope to the human fabric of each place. If the whole world can be contained in a drop of water, then entire galaxies can be contained in a drop of beer…as long as the drop of beer is not light beer, “light beer” being a foul contradiction in terms. Thanks Jud – one of the primary “inspirers” for this enterprise. After all, if I model after someone with enough creativity to initiate the Gulf Coast Humanities Consortium, I can have some fun and hope the readers do as well. Dirt: “I like that Sessions beer. Must have been another group. We did our “journey” on a Sunday afternoon on the East side. No one could capture the journey better than The Beerchaser! I look forward to chasing more beers with you again soon! This idea could gain traction and go viral. I will pass it on to Thebeerchaser Advisory Committee (currently only me and a guy named Irish Mike at the Old Oregon Saloon in Lincoln City, Oregon). While Kansas became a free state in 1861 and we are too late for their Centennial, it could be one of the biggest events in Salinas in years and a chance for the revitalization of the Rendezvous Saloon. Thanks Dave for your vision and insight.